When I saw Jayne/Twiggy & Opal's quilt-in-progress pop up in my Instagram feed the other day, I did a double take!! I stopped to take a better look, and oh yeah, it was so reminiscent of my own Monochrome. Being so, of course I loved it, and naively commented, "Love this! I made something similar but different...." Duh. And that's when Jayne told me, "@aquilterstable your quilt was what inspired me! I love what you did!" Well then! Check out Jayne's post about her now-finished Threads. You need to see it close up! From here you can see some similarity to Monochrome, pictured below, but of course Jayne made it her own by tweaking the improv under the influence technique and adding in bits of color. It's up close, though, that you also see she added color through her quilting. Marvelous. I came oh so close to adding color in my quilting of Monochrome, but in the end, obviously stuck with the neutrals. And I love it. But even more, I enjoy the two takes, Jayne's and mine, similar but different. I love how inspiration does that - is such a personal thing, and becomes something new. Of course, my own inspiration for Monochrome came after I made Room Temp during a class with Krista/Poppyprint. I was so taken with the improv under the influence technique, that I finished my version pronto, and then wondered, "what next?" 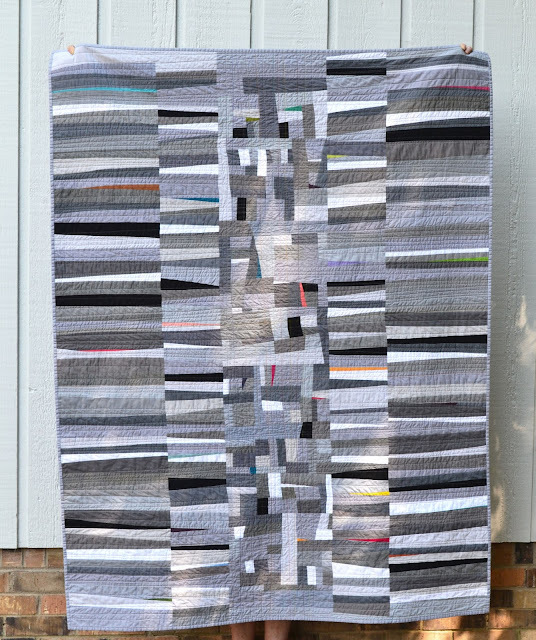 Here is Krista/Poppyprint's own original Improv Under the Influence quilt. I know I've traveled 'backwards' in this post, but isn't it great how the inspiration flows . . . tweaking as it goes, according to each person's vision, yet having similar elements that tie them together. This is such a fun post. Thank you for sharing. Jayne is in my guild (Music City MQG), and everything she makes inspires me! Thank you so much for the inspiration! It is such an amazing feeling being inspired and then inspiring someone else! It was important to me to make mine different enough, but it is obviously heavily influenced by your gorgeous quilt! 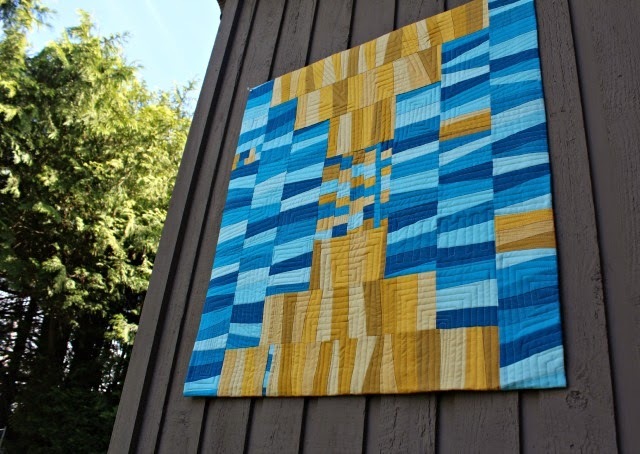 I'm blown away by your kindness and thank you so much for featuring and sharing not only my quilt, but what you were inspired by! Great post!! I saw hers on IG too & immediately remembered yours! Both gorgeous. You are very gracious to feature hers here as well. This post just makes me so happy!!! Thanks Deb! Love this so much, Debbie! I love all the versions, each quilt is wonderful, similar yet original. I love when quilters add their own twist....so wonderful!!! It is always fascinating to see how far a little tweak here and there can take someone else. Both yours and Jaynes quilts are wonderful! As they say, imitation is the sincerest form of flattery. 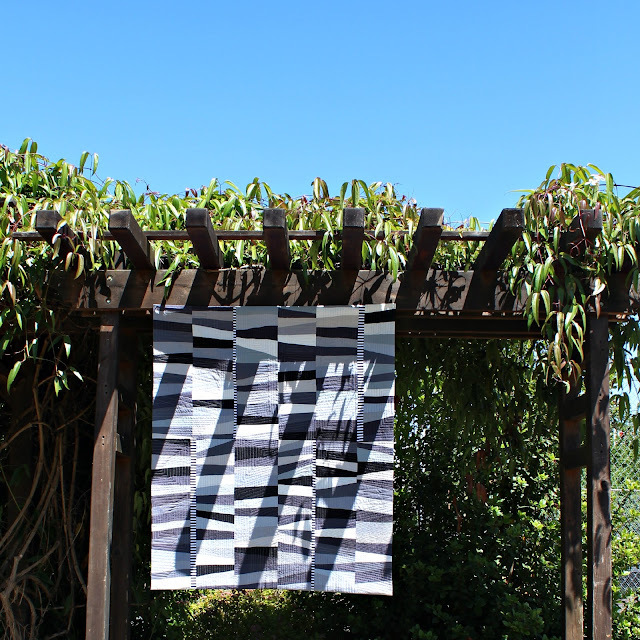 It's so lovely to see the evolution beginning with Krista's improv quilt inspiring your version and then your Monochrome inspiring Jayne's version. We see this a lot in the quilting world....it's a nonstop flow of inspiration! It's fun to see the influence and inspiration as it progresses.